With your Canon EOS Rebel XT DSLR Camera, a.k.a. 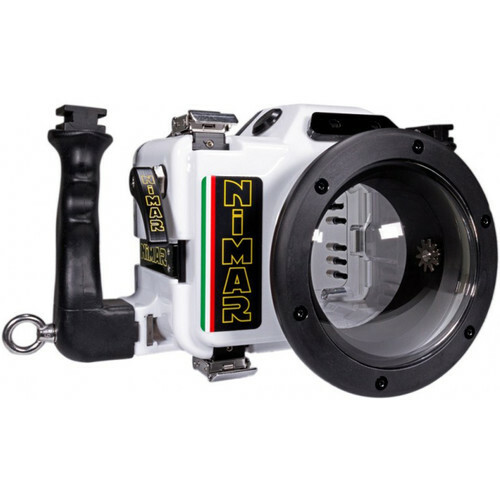 the 350D, in this Nimar Underwater Housing, you can capture brilliant images of coral, blue hippo tang fish, and whale sharks at depths as great as 197'. The enclosure features a moisture alarm that alerts you in the unlikely event of a breach in the waterproof seal. The camera's built-in flash can trigger optional external strobes via cables connected to the housing's dual fiber-optic ports. As an alternative, the housing's M14 port allows for the addition of an optional bulkhead connector for hard-wiring a strobe using a sync cord. Mechanical push-buttons, dials, and a lever afford access to most camera functions, while dual ergonomic grips improve handling and provide attachment points for optional lighting arms. A removable eyepiece helps you compose shots through the camera's viewfinder. The housing ships without a required lens port, and accepts interchangeable ports for a broad array of different lenses. For complete compatibility details, see the list below. Built for durability, the housing is crafted from corrosion-resistant polycarbonate, which is white on the front, top, and sides, but clear in the back to allow you to monitor the camera and O-ring seal. Stainless-steel latches with safety clips ensure that the enclosure stays shut during your dive.